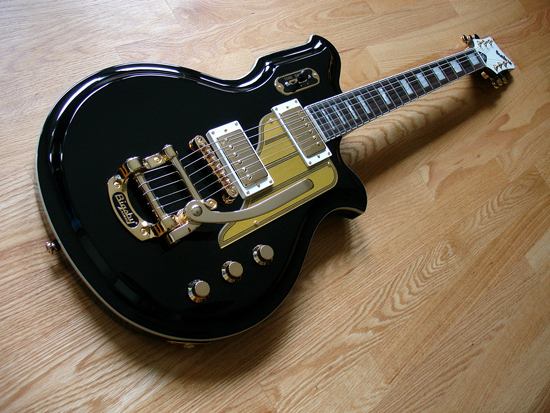 Eastwood Special Order Guitars – Order Yours Today! 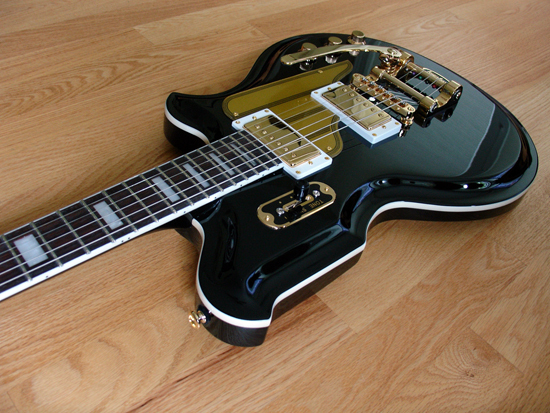 Earlier this year a customer came to us asking for a custom shop guitar. 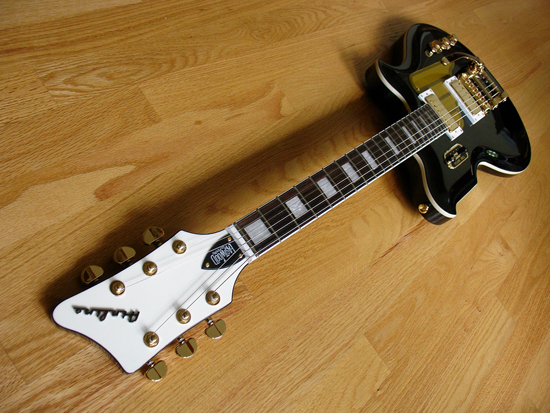 He wanted an Airline MAP guitar, but he wanted it with gold hardware, gold switchplate and gold pickguard. Our standard reply was, “Any time we introduce a new color/model, our factory has to make a minimum of 8 pcs, so if you want to buy 8 of them, we’ll do it”. Typically at this point the customer will say, “Oh, I guess that’s out of the question then”. Send us deposit of $3,000 to commit to the order, and within 3-6 months, the 8 custom guitars will be completed. Once complete, we send him his one guitar. 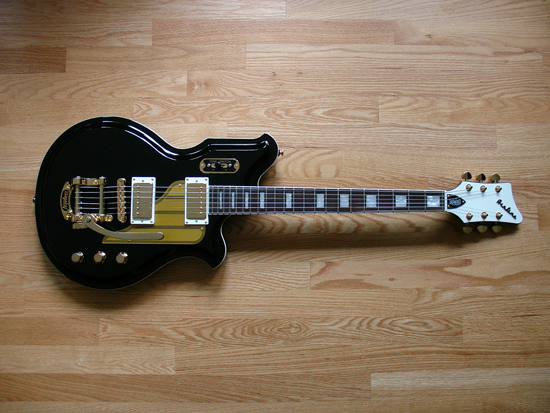 Once we have sold 4 of them, we refund $2001 back to him, making his cost on the custom guitar of his design only $999. He agreed, and here is the guitar (sorry, they SOLD OUT within the first week!!). OK . . . left handed Bass VI, metallic margarita green with a purple pickguard. The Gammacaster! WHO’S WITH ME? Cool idea! I love when small business owners come up with creative solutions like this. And it’s a very cool guitar! What about a double-cut dual tone? Or is that different? I got one of those! Everyone who’s seen the guitar falls in love of it! I just bought a Ichiban Galesi. was this why that guitar exists? I really really love this idea! It makes me wish I had a little extra $ to spend right now. Keep thinking outside of the box, putting customers first, and cranking out awesome instruments!!! I’ve been interested in either a Supro Dual Tone, Airline Twin Tone, or Airline H44 Dlx, but with the bridge/tremolo system of the Ichiban or Sidejack Dlx. Are you going to do another run of these black Maps with gold hardware? I would be interested. yes, we will start taking orders in October. Some guitars are “custom”, which means different colors or options. Some are “Limited Edition”, which means only a limited amount are made of them. I wonder of anybody would want a different color tenor? Not sure if they are hot sellers. A candy apple red, sea foam green might be cool for that. I am the one who thought of the guitar. Mike was great to work with on it and I have had great feedback on it. I am glad it sold so quick! How do I get a hold of Eastwood by Phone? For some reson can’t get through on that number. What I wanted to know is if I can get the 2pdlx vintage reissue Eastwood in Seafoam green with a wtite pick guard and wihte buttons and chrome keys and a Bigsby with out killig me on money. Thank you very much.I like your guitars I think I am going to go with the Airline map in the seafoam.If I had that kind of money I would do to in heart beat. 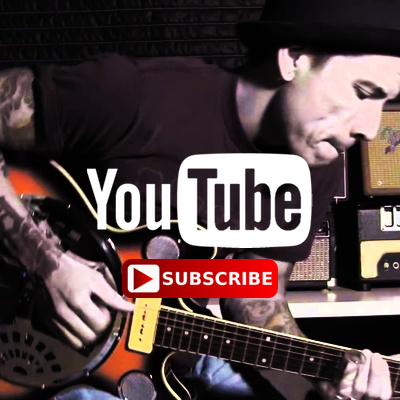 Thank You for your time Mike N.
Suggestion for new model: a thin-line, single Florentine cutaway, similar to Epiphone Sorrento or Dearmond Starfire Special. Or double cutaway like Eko Florentine. I’m the happy owner of an Eastwood Doral (my fave) and Supro Coronado, both lefty. I think Epiphone is doing the Sorrento already (soon) and likely made in China. 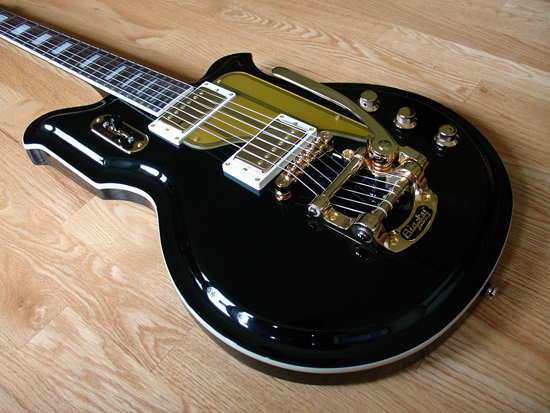 What about the Gretsch Super Axe without all the on-board stuff? Super Axe type would be cool, too. 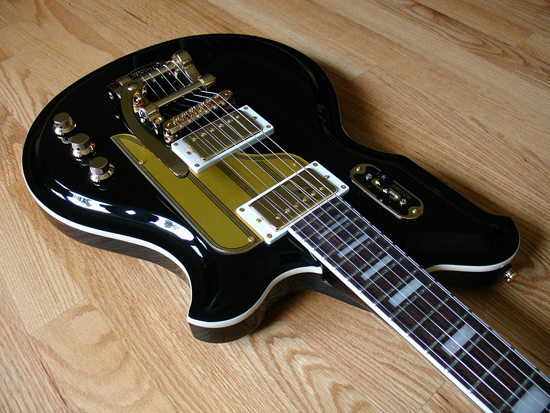 P90s or those coil-tapped humbuckers like you put on the Doral! Better still: HiLoTron single coil type. Am I the only player who loves the sound of HiLoTrons?! As a proud owner of one of those first eight custom black Maps, I want to shake that man’s hand! A Sunburst or Natural Airline Folkstar would be AMAZING!!! But, I don’t have the 3000$! If one day, Airline decide to do a Natural Airline batch, I’ll be the first one to put my hand on one of it! 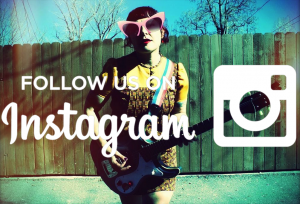 I was hoping that back in 2013 you would come out with the Airline Pocket Bass. Please bring it back to life. It was a really sweet little bass. Such a great idea! Maybe you could offer a way for people to pool the money too. How about a clear coated pine wood tenor with two single coils and black guard? Optional black headstock and I’m guessing a tremolo would be too much to ask for a four-string instrument, right? Any Lefty’s out there interested in a Deep Purple Sidejack? Definitely interested. Lefty stuff…. 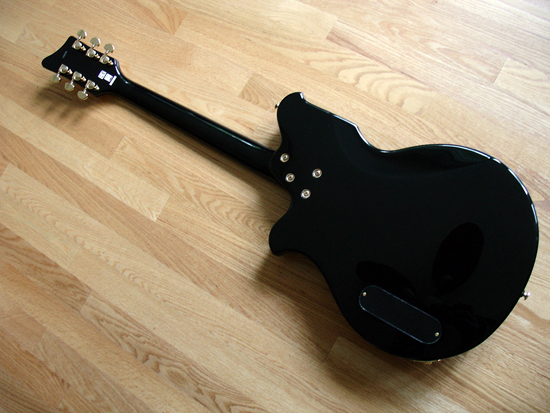 Bass IV in black, hardtail. Maybe a Hi Flyer bass in black. I think a map Mandocello would be a pretty sweet instrument, to compliment the map mandola.